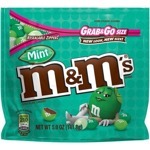 Dark Chocolate Mint M&M's come in three shades of green, but each is just as minty as the last! M&M's with a delicious dark chocolate centre and a dash of mint. 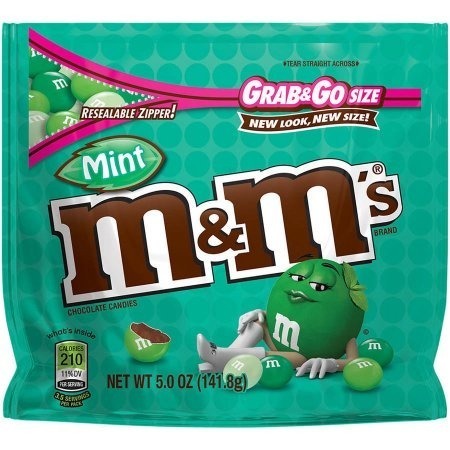 These M&M's are coloured in various shades of green to match their minty flavour. Milk Chocolate (Sugar, Chocolate, Skim Milk, Cocoa Butter, Lactose (from milk), Milkfat, Emulsifier (Soy Lecithin), Salt, Artificial Flavours), Semisweet Chocolate (Sugar, Chocolate processed with Alkali, Cocoa Butter, Milkfat, Emulsifier (Soy Lecithin), Natural and Artificial Flavours), Sugar, Cornstarch, Corn Syrup, Thickening Agent (Dextrin), Colours (Includes E102, E133, E110, E129, E132), Gum Acacia, Natural Flavour.